With a hint of sunshine comes the hope that this year we’ll be able to soak up some rays in the back garden, have friends round and show off the beautiful space we’ve been cultivating all year. This summer, if you’re considering th rowing a few parties (or, fingers crossed, some BBQs), then take some time to look at your garden with fresh eyes. It’s not just a lawn and some shrubs; it’s a social space for entertaining, relaxing and playing with friends and family. To really make your garden into a social hub during summer, first think of it as a collection of areas for different activities. Just as you might have your lounge for relaxation and your home office for hard work, so you can have similar spaces in your garden. You can start to identify these different areas with key design elements. Colour is an important component, which you can establish with planting, but texture is also essential. We’re naturally very tactile creatures and we respond to textures in different ways; a soft, fluffy blanket encourages us to relax, while a cool, marble worktop keeps us alert. In each area, use textures, colours and other design elements to communicate the feeling you want visitors to have in that space, from a busy area for socialising to something more serene and contemplative. Here are our suggestions for creating different areas in your garden this summer. Undoubtedly there’ll be children at your outdoor event, or at least some adults who are keen to prove their sporting skills! Even in a small garden, you can dedicate some space to a playful, exciting area which is safe for children (and out of the way of adults trying to relax). Grass, woodchip and other softer but hard-wearing textures are good for these areas, and you could add a touch of fun with something like our Timberstone log garden stepping stones. Keep a clear border to this area, so children know where the most appropriate area to play is, and make planting low-level so it’s easy to keep an eye on them. Your outdoor space is a natural extension of your home, and especially so when it comes to cooking, dining and drinking outside. As it can get visually ‘busy’ with food, drink, people and decorations, geometrical shapes and clean lines can act as an elegant, minimal backdrop. 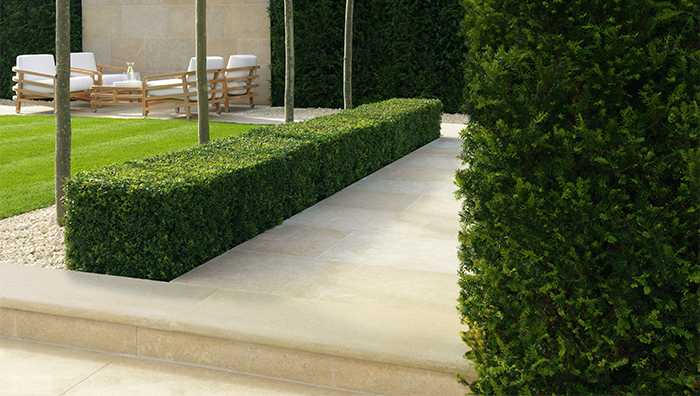 That doesn’t mean it has to feel clinical or cold; materials like the wood-effect Knotwood vitrified garden paving or the Vintage Stone Frost garden paving, which has an already-aged appearance, add warmth and personality while still being simple and subtle. 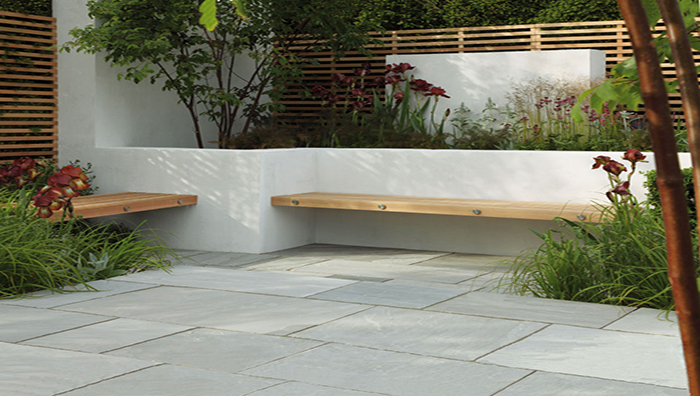 Outdoor furniture is naturally a useful way to define this area, but you might also want to consider how you can build in permanent ‘furniture’ – such as low walls for seating – to keep the area as sleek as possible. Plenty of socialising in summer means having a space where friends (or the host!) can escape and relax. A contemplative, calming area is easy to create alongside more social spaces with the right mix of textures and sensory elements. Choose softer and more organic shapes for this area of your garden, with higher planting so the space has a greater feeling of seclusion. Asymmetry is common in nature, so use this in your planting to avoid any ‘man made’ appearance. 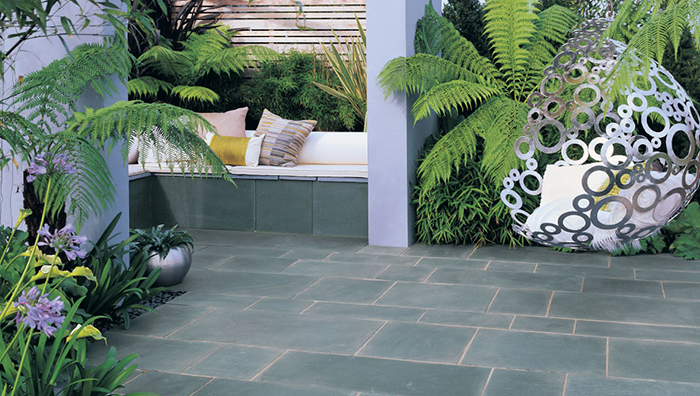 Engaging in a multi-sensory experience is an excellent way to relax, so in this area you might use heavily-scented plants or herbs, tactile greenery and dramatic paving, like the black Equinox Quartzite garden paving, to encourage a really immersive feeling of relaxation. A good British summer is a rare and fleeting thing. By breaking down your garden into different areas that reflect different activities, you can start to create a social space for summer that encourages your guests to play, socialise and relax while they make the most of the sunshine.